As a 501 c 3 non-profit, Clay on Main loves to get the community involved in the arts within our walls through music, gallery events, gallery opportunities, and classes, workshops, and open studio time. One of our main goals is also to get the community involved OUTSIDE of our walls, in the towns and communities not located right next door in the Oley Valley. In the past, we have provided fun activities for local festivals, fairs, and other events. We’ve provided space for outside organizations or groups to come in and discover the joys of creating. We’ve invited other non-profits, poets, and artists to partner with us in community projects. Every year we hope to continue our outreach and engage individuals and families alike to discover what we at Clay on Main already know: that providing a friendly space and the right tools for creating enriches life, for you and those around you. Clay on Main has worked with the John Paul II Center on several projects in the past, and it’s with great pleasure that we announce that we are working yet again with the fabulous students there to create a community mural. This mural was created in part by the students from the JPII Center. 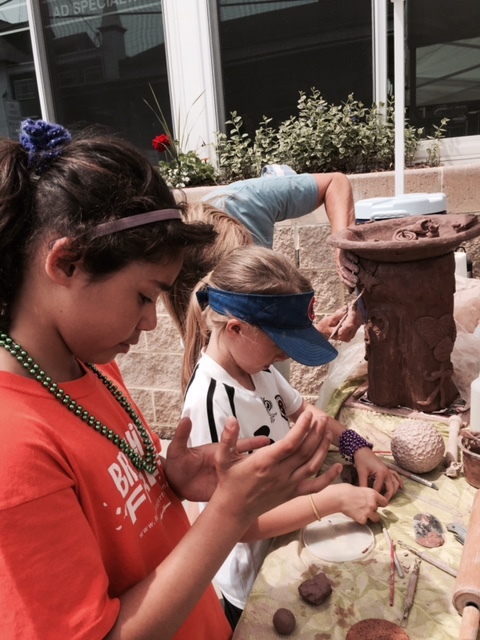 They were asked what it means to them when they’re able to come to Clay on Main to create. Those words were then turned over to Berks County Poet Laureate, Nancy Yeager, who created a beautiful poem based on their ideas. Once this poem was complete, it was then given to a Clay on Main member who worked previously on designs for the Poet’s Wall completed in 2010. She created a design based on the poem, working within the dimensions of the wall and the color palette of the previous mural. It will be located nearby to the Poet’s Wall. Read what the JPII Center has to say about the project here.